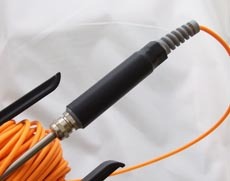 These sensors are manufactured from rolled stainless steel tubing with a plastic handle and a waterproof cable entry gland. 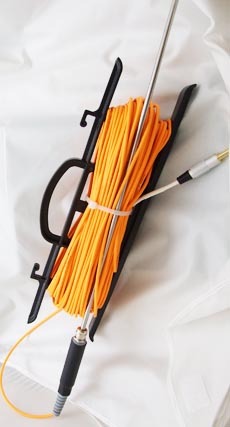 Various lengths of sensor probes are available to suit your application. These sensors allow for accurate temperature measurements at known depths. Sensors are fully waterproof with an accuracy of 0.2c over the working temperature range of -10c to 75c. The actual sensor is based on thermistor technology and provides a repeatable and a fully interchangeable system. 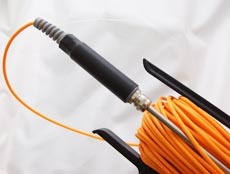 Various lead lengths are available from 1m to 75m lengths. 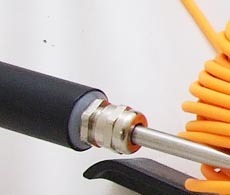 Electrical connections are available in either jack plugs or 4 way AMP connectors. Typical applications include Mushroom bed probes and timber drying applications. Outside diameter of the probe is 8mm.